NEW YORK (CNNMoney) -- Yikes. It looks like the dollar is putting up less of a fight against the euro and other major currencies than my beloved Knicks did in their playoff matchup with the Boston Celtics. The dollar is getting weaker by the day, and while that may be a plus for the earnings of multinational firms like IBM (IBM, Fortune 500), Coca-Cola (KO, Fortune 500) and Procter & Gamble (PG, Fortune 500), that's not good news for many consumers. The greenback is now trading around $1.46 versus the euro. To put that into context, the once-mighty U.S. currency is now only about 9% above the all-time low it hit against the euro back in July 2008. Need I remind you that those weren't exactly good times? Oil and gas prices were at record highs. Investors were worried about the health of the big banks and the housing market. The bear case: It's almost eerie how we could be heading for a sequel of this scenario just three years later. 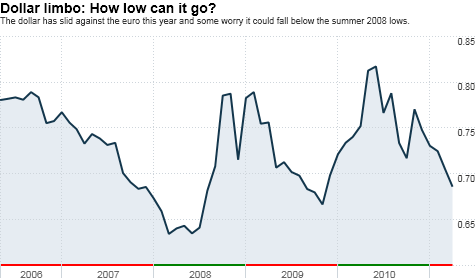 "It is plausible that the dollar will hit another all-time low against the euro. Conditions do not appear to be very encouraging for the U.S. currency," said Vassili Serebriakov, currency strategist with Wells Fargo in New York. There are several reasons the dollar may get weaker in the next few months. First, there's the Federal Reserve's accommodative monetary policies -- i.e. rates near-zero and the controversial bond buying programs known as quantitative easing. Although the Fed is meeting on Tuesday and Wednesday and is likely to reiterate that its latest round of QE will end as scheduled in June, few expect Fed chairman Ben Bernanke to suggest that the central bank will soon raise interest rates. Then there are concerns that the U.S. government is not going far enough to tackle the massive budget deficit. Those fears really hit home last Monday when rating agency Standard & Poor's lowered its outlook for U.S. debt. "There is no greater indicator of the health of a nation's economy than its currency," said Anthony Welch, co-manager of The Currency Strategies Fund (FOREX), a mutual fund in Sarasota, Fla. specializing in foreign exchange investments. "Fed policies are keeping the dollar down and the world is growing increasingly worried about the debt situation in the U.S. That's all there is to it," Welch added. 0:00 /4:10Why is Japan's yen so strong? Or is it? Yes, the dollar is getting beaten up as of late. But like 2008, oil and gas prices may soon reach a level where it becomes blatantly obvious that they will soon peak because those higher prices are destroying demand. If that happens, the dollar could rally as commodity prices fall. The bull case: Yanick Desnoyers, assistant chief economist at National Bank Financial Group Montreal, argued that the dollar should soon stage a comeback against the euro because higher commodity prices may hurt the fragile recovery in all developed markets. 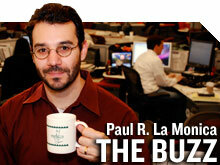 He said it's doubtful that the euro will go any higher than $1.50. Keep in mind that even though the dollar has lost ground against the euro, it's not as if Europe's financial house is in tip-top shape. Far from it. It's a bit odd that one of the primary reasons cited for dollar weakness is the concern about how bad the debt problems could get in the U.S. At the same time, the euro has rallied despite many current problems across the pond. "If the deterioration in euro debt continues, the foreign exchange markets will have to eventually question whether the euro should fall in order to catch up with all the bad headlines," said Serebriakov. It's also worth noting that things have been so bad for the dollar, it may not take much in the way of good news to get it heading higher again. The U.S. Dollar Index, which tracks the dollar against the euro and five other currencies, is only 5% higher than its all-time low from March 2008. Experts said many currency fund managers are actively shorting the dollar. Welch admitted as much too, saying his fund is short the dollar and Japan's yen, and long just about everything else. So in a strange twist, the dollar could get a boost precisely because so many people hate it right now. Those who are short the dollar may have no choice but to buy it in order to cover their positions if the greenback starts climbing again. "We could be ripe for a rally once this move down exhausts itself," said James Dailey, manager of the TEAM Asset Strategy Fund (TEAMX) in Harrisburg, Pa. Dailey said he thinks it is highly unlikely the euro will go any higher than $1.48. The currencies-move-in-mysterious-ways case What will be the catalyst to get the dollar moving higher again? That's tough to figure out. Desnoyers said any hint that the Fed will raise rates should boost the dollar. He thinks the Fed will start hiking later this year but conceded that this is a minority point of view. Dailey added that the problem with currencies -- as opposed to stocks and bonds -- is that it's almost impossible to put a hard value on them. That's another reason why precious metals, a tangible currency alternative, have been rallying. You don't have valuation ratios and earnings growth estimates to look at like with stocks, or yields like you do with bonds. In many respects, the currency market is more alchemy than hard science. "We have reached a point where normal market criteria would suggest the rubber band is getting pretty stretched and the dollar should bounce back." he said. "But currencies are not normal markets. They are, for the most part, purely faith-based." And while Dailey said that there is a good chance the dollar could soon enjoy a sharp rally, it's not hard to envision the exact opposite scenario unfolding. "As weak as the dollar has been, it's been an orderly decline," he said. "We need stabilization soon or there could be growing concerns that the sell-off will turn into a full-blown crisis." Time to short the U.S. dollar?